The support we receive from individuals, families and companies is what sustains our year-round mission on a daily basis. When you give to Angels’ Place, you’re helping families across the Pittsburgh area receive the everyday essentials they need. Adopt an Angel is our monthly giving program. By symbolically adopting, you are empowering our little angels and their parents to reach their full potential. Following your first donation, you will receive a Welcome Package and additional monthly acknowledgment and updates. This opportunity is open to both individuals and businesses. All Adopt an Angel donors will be mentioned in our Halo Award Dinner. Donors at all levels will be added to our website as well as to our digital and physical mailing list ensuring you will be the first to know what is happening at Angels’ Place. Through our highly competitive Showcase of Scholars Program, Angels’ Place seeks to actively encourage and advance exceptionally high levels of scholastic achievements from our student parents while fostering a greater understanding of self, family, and community. Our Scholars set a benchmark for success as role models to their peers in the Angels’ Place program. Our Showcase of Scholars program honors our parents for their achievements. Individual sponsor rate is $500 per year and a business sponsor rate is $1,000 per year which helps support a Scholar’s participation at Angels’ Place. Not only will this promote two generations of success, but Showcase of Scholars sponsors will be featured on our website as well as our program at the Halo Award Dinner. For more information about Showcase of Scholars, please email Cari Goss Quinn, Development Director, at cquinn@angelsplacepgh.org. Many workplaces provide opportunities for employee participation in fall giving campaigns. Some encourage giving through America’s Charities, a national program through which the employees of many companies are able to engage in charitable giving. The Angels’ Place EIN#, 25-1450489, is the code number to use on the America’s Charities form available from participating employers. If you are a federal employee, you can give through the Combined Federal Campaign, for which the Angels’ Place code is #44139. State employees wanting to give through your workplace giving campaign, use the code for the State Employees’ Combined Appeal which is #5000-0017. 1. Completing the Contributor Information and Payment Method sections. 2. Filling in “Angels’ Place” in the agency designation section, along with the code for North Side Center (#1200) or for Swissvale Center (#3977). 3. Allowing us to acknowledge your gift — please do NOT check the box at the bottom of the form telling the United Way not to release this good news to Angels’ Place. Would you like to maximize your personal donation to Angels’ Place at no further cost to you? If you work for a company with a Matching Gifts Program your contribution can be doubled (or even tripled) by your employer. Many companies match employee donations. Please check to see whether there is a Matching Gifts Program where you work. The Commonwealth enacted the Educational Improvement Tax Credit Program to allow businesses to support education in Pennsylvania. Angels’ Place is included on the state’s list of eligible scholarship organizations through which businesses can take advantage of the Pre-Kindergarten Scholarship Tax Credit to make tax-advantaged contributions. The scholarships go to eligible three and four year old children enrolled at Angels’ Place. If a business owes up to $10,000 in state taxes it can contribute $10,000 to Angels’ Place in lieu of paying that tax money to the state, as long as the supply of tax credits has not been exhausted. There is minimal paperwork. Also, some businesses contribute more than $10,000, and receive a tax credit equal to 90% of any additional amount. For more information, please contact us at 412.321.4447, or access www.newPA.com/EITC. Angels’ Place, Inc. is an approved 501(c)(3) nonprofit organization- contributions to which are tax deductible to the fullest extent of the law. The official registration and financial information of Angels’ Place, Inc. may be obtained from the Pennsylvania Department of State by calling toll free within Pennsylvania 1-800-732-0999. Registration does not imply endorsement. Contact Cari Goss Quinn, Development Director , at 412.321.4447 or cquinn@angelsplacepgh.org for more information. Have an old car taking up space in your driveway? Donate it to Angels’ Place! Making a donation is easy. Click the donate button to get started and for more information about the program. If you have any questions, call toll-free 855.500.7433. Shop at Rid Aid and support Angels’ Place! Go to kidscents.com and follow the steps below. Rite Aid will match your gift. 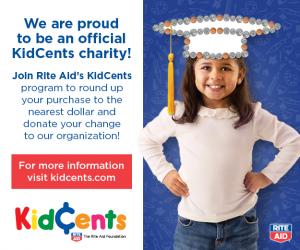 Sign into your wellness+ rewards to participate in the KidCents program. After you are logged in, choose the “Select a Charity” in the menu and pick Angels’ Place, Inc.
Next time you shop at Rite Aid and your purchase is rounded up, the change will be given to the charity you selected. Use your KidCents see how much you have given to your selected charity.